Does the Ridership-Coverage Question Apply to Bikes? Really? 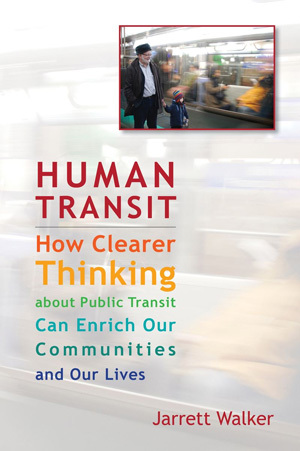 I’ve read their summaries for years and came away with the idea that Texas Transportation Institute feels that a good public transit system is essential for free-flowing traffic. Without public transit there would be much more auto congestion. I started reading their work because my “favorite” anti-transit advocate always held up their work as his proof until they started advocating for transit (not that they would take it, just that it took extra drivers off the road). Jarrett, I think if you wrote a book on ‘How to Think and Read Clearly!’, I and a lot of other people would buy it. Always impressed how lexical gymnastics can throw so much light on aspects not apparent at first glance. So this begs the question — is there are a good report that focuses on urban mobility? It seems to me that one of the essential parts of a report like that is to focus not on distance, but human interaction. That is essentially the definition of “urban” — how much human interaction there is. So, if it doesn’t take long to get together with another person, then the place is fairly mobile. A good example is Manhattan. Even if there was gridlock in the streets and a transit strike, it would be fairly mobile. Tens of thousands of people can get together within minutes just by walking a few blocks. This is much better than, say, Moses Lake. Moses Lake may have a nice transportation system, but if thousands of people tried to get together in one spot, it would take them a very long time. When you consider that Manhattan does have a subway system and buses, and is connected to millions of other people (who can ride the subway or buses) New York City would probably be at the top of the list. But as you move down the list, some surprises might occur. Washington DC has horrible traffic, but a very good transit system. But how would it compare to a city that has weaker transportation, but more density? I think the results would be very interesting (although very difficult to gather). @Dexter Wong – There’s a couple issues here. First is that regardless of whether they “advocate” for transit, they way they define urban mobility just looks at auto congestion. This is not even a good way to measure mobility for drivers because it values long distance driving at high speeds over situations where you can travel short distances easily. Secondly, if you define transit in terms of ‘reducing auto congestion’ it will always fail. This is not what transit is supposed to do nor is it terribly successful at it. In general, the problem with the report is that they are defining “mobility” in terms of a very particular type of movement (basically people driving in the suburbs to the city center.) That leaves out huge numbers of people and completely misses how other aspects of city design and policies can affect everyone including drivers. There is a whole industry fixed on the state of roads to the exclusion of the rest of geography and ecology. The rest makes it too complex and multi-dimensional. This is not so much about the need of our simple minds to fragment a big world as it is the delusion that something could be done about parts of the world as if they objects of plans. Thanks Jarrett — that’s exactly what I wanted. Another issue is that is only measures congestion rather than total travel time and makes no account for sprawl. So, a 30 mile trip to work that takes 30 minutes is better than a 10 mile trip to work that takes 20 minutes. It’s not a measure of how long it takes the average driver to get to work, is a measure of how fast the average driver can go. For what it’s worth, it seems criticism of the TTI Mobility Scorecards is catching on: in a graduate-level transportation planning class a few years ago, the instructor raised essentially the same objections to the report. It is fair to say that the class consensus was that the report’s methodology and approach certainly encourages sprawl. To add to Gary’s comment, this TTI example reminds me of the analogous example of the media reducing the issue of improving infrastructure (ports, water and sewer systems, electrical grids, passenger and freight lines, sidewalks, etc.) into an issue of simply “fixing roads and bridges.” Given all the flak the media gets for being NYC or DC-bubbled, you’d think they wouldn’t be as susceptible to windshield-vision like the TTI, and yet they are.